The BMZ2 discovery has been extended by approximately 25 metres laterally and up to 150 metres vertically and now covers an area measuring 100 metres laterally by 225 metres vertically. BMZ2 remains open both along strike and at depth. Two diamond drill rigs have begun drilling to follow up on this promising new zone. Underground development, which is advancing easterly towards the zone, is anticipated to reach BMZ2 by April 2019 , with definition drilling to begin shortly thereafter. TORONTO , March 1, 2019 /CNW/ - Continental Gold Inc. (TSX:CNL; OTCQX:CGOOF) ("Continental" or the "Company") is pleased to announce additional high-grade assay results from 10 holes drilled into the Yaraguá system as part of the exploration drilling program at its 100%-owned Buriticá project in Antioquia, Colombia . The Company plans to drill up to 73,500 metres in 2019, consisting of approximately 55,000 metres of capitalized definition drilling and approximately 18,500 metres of exploration-led infill drilling. Supporting information for results discussed in this release can be found in Table 1 and Figures 1 and 2. "With only 15 drill holes completed to date into our newly-discovered BMZ2, we are off to an exciting start in outlining this new zone. Due to BMZ2 demonstrating excellent continuity and high grades over robust thicknesses, the Company has prioritized both exploration and definition drilling for the zone on the belief that BMZ2 will ultimately be integrated into the early years of mining for the Project," stated Ari Sussman , CEO. Ten diamond drill holes were completed in the eastern area of the Yaraguá system, of which seven drill holes targeted BMZ2. Unfortunately, two holes (BUSY394 and BUSY396) were completed prior to receiving assay results leading to the January 15, 2019 announcement of the discovery of BMZ2 and consequently were drilled too far north to intercept the zone. The five holes that intercepted BMZ2 all successfully encountered high-grade gold over robust thicknesses and extended the dimensions of the zone to 100 metres along strike by 225 metres vertically. BMZ2 remains open along strike to the east and at depth for future expansion. Two diamond drill rigs are now turning and assay results will be reported in due course. Two diamond drill holes (BUSY385D03 and BUSY385D04) tested a section of the current mineral resource model approximately 200 metres below the elevation of the Higabra Tunnel which intersected gold mineralization, including a best intersection of 6.10 metres @ 7.78 g/t gold and 5.8 g/t silver (BUSY385D04). Additionally, one diamond drill hole (BUSY403) deviated from its planned location approximately 75 metres east of BMZ2 and potentially discovered a new BMZ zone. 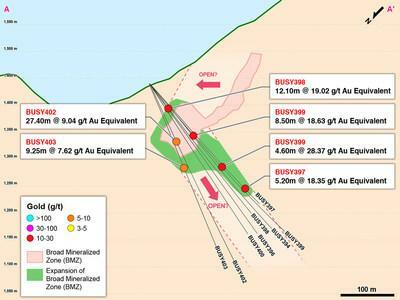 Results include two broad lower-grade intervals and one high-grade interval of 9.25 metres @ 7.62 g/t gold equivalent. Grades herein are reported as uncapped values. Gold equivalent in this release and table was calculated at Au:Ag ratio of 75:1 with no assumptions made for metallurgical recovery rates. True widths intercepted modelled veins outside of the BMZs are estimated to be between 75-100%. In the BMZs, however, the zone consists of veins at various orientations so individual drill holes will intercept certain veins within the zone at up to true orthogonal angles and others at up to oblique angles. BMZ2 is a three-dimensional orebody interpretation and modelling with variability in width, thickness along a vertical extension. Additional core drilling is been planned to define its characteristics, such as gold/silver grades, geometry and vertical extension.